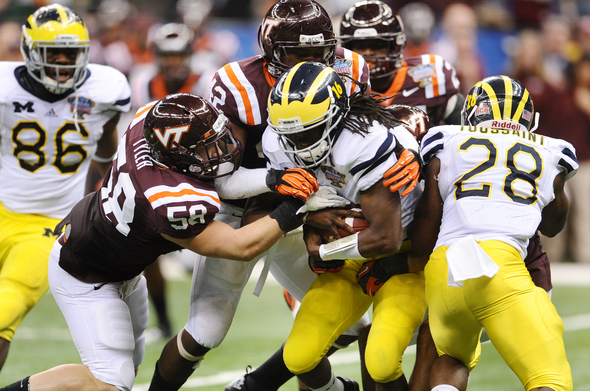 Michigan quarterback Denard Robinson was limited to 16 yards rushing by the Virginia Tech defense in the Sugar Bowl. NEW ORLEANS — The Michigan football team struggled to move the ball for the third time this season. Twice, it lost. Not this time. Michigan prevailed 23-20 in overtime against Virginia Tech on Tuesday night in the Sugar Bowl, the program's first BCS win in more than a decade. Kicker Brendan Gibbons became a hero with two clutch field goals, including the game-winning 37-yarder in overtime. The victory was a lot of things. Pretty was not one of them. The Wolverines (11-2) managed 184 yards of offense against Virginia Tech, the only time this season they gained fewer than 250. They are just the third team in eight seasons to win a bowl game while gaining fewer than 200 yards. They were doubled-up by Virginia Tech, which gained 377 yards. Michigan quarterback Denard Robinson, so good in his previous two games, was bottled up and finished with a career-worst 13 yards rushing. He was stuck on zero midway through the second half. Robinson combined this season with sophomore tailback Fitz Toussaint to become Michigan's first pair of 1,000-yard rushers since 1975. Against the Hokies, they combined for 26 carries and 43 yards. No player had more than two catches. No rusher gained more than 30 yards. "We were looking at the third-quarter stats on the screen, and they had more first downs, they had more total yards, they had more time of possession — but we were still up," senior tight end Kevin Koger said. "We had no idea why. It wasn’t pretty, it was definitely ugly, but we got through it." When paired with Michigan's inability to get off the field on defense — it allowed Virginia Tech to convert all but one of its third-down attempts of 8 yards or longer, and the lone miss led to a fourth-and-11 conversion — it's difficult to imagine a scenario in which the Wolverines could win a BCS game. That meant 45- and 18-yard touchdown passes to receiver Junior Hemingway. They were the Wolverines' only touchdowns, and were enough for Hemingway to earn MVP honors, despite not recording another catch. Even those positive plays were fortunate, as both passes were off-balance heaves to a blanketed Hemingway. The senior has been a virtuoso this season on jump balls, but the difference between success and failure on both tosses was incremental. Michigan turned up on the right side of both plays. "We've always had a lot of confidence in that combination and, sometimes, you are going to make plays," Michigan coach Brady Hoke said. "You've got to have guys who can make those plays, and when they're the ones doing it, you feel pretty good about it." How did Michigan conjure a win while not being able to move the ball on offense nor get off the field on defense? It benefited from a series of fortunate twists. Two Robinson interceptions were negated, including one on a defensive pass interference call two plays before Hemingway's final touchdown grab. Michigan’s fake field-goal pass attempt just before halftime caromed into the air and found long-snapper Jareth Glanda, despite the play being doomed from the start because several players didn’t know the team had called a fake. Even in overtime, Michigan benefited from Danny Coale’s touchdown catch in the corner of the end zone being overturned. Virginia Tech had to settle for a field goal, which it missed to set up Gibbons’ heroics. Fri, Jan 6, 2012 : 3:16 a.m. Given that I'm a &quot;hopeless case&quot; Wolverines fan, I can only embrace missionbrazil's analysis. Good job, missionbrazil! I want to add: twice this season, Michigan scored twice in under 50 seconds. The first time, that won the game against Notre Dame. The second time: that two (too) quick scores caused the Hokies on the bench to show pained expressions as they looked up at the score board. Their expressions said: W-T-H?! We're kicking their butts but they're beating us!! Those two incidents are priceless moments for Michigan fans: we should never forget what our Wolverines are capable of. Beyond that: I'm certainly hoping that Michigan coaches will keep doing what they've been doing - and that includes realistic analysis and adjustments from lessons learned. That definitely includes the lessons from the Sugar Bowl. For the coming recruiting days and Signing Day - I can only say: GROW BLUE! Get bigger and faster, Blue. Don't lose the 60-minute-PLUS playing time resolve. Thu, Jan 5, 2012 : 10:46 p.m. Both Michigan and Michigan State did great, although I think I enjoyed watching the State game more. Thu, Jan 5, 2012 : 8:30 p.m.
2011 and the recent bowl game win are past tense. I'm already thinking 2012 season and that Alabama game. I hope that game was not a barometer of where wr;re at on offense. As I said, it's all a moot point now. I'm about Al Borges age and I know how stubborn us old farts can be. When my wife tells me I'm acting ridiculously stubborn I try to adjust. Can you hear me Al Borges? Statistics are often over-rated and overstated as a way to judge a team or individual player. The only statistic that really matters is the final score. How you get there statistically doesn't matter. Points are earned in football based on performing certain actions - like getting the ball over the goal line and kicking it through the uprights. Michigan did both these things more than VT. Therefore, Michigan &quot;deserved&quot; to win more than VT. It's that simple. Thu, Jan 5, 2012 : 8:03 p.m.
Luck is when hard work meets opportunity, and when a up-for-grabs pass tossed blindly by Denard is caught after opposing defenders run into each other, and when a botched fake field goal is tipped by the defense into the loving arms of a Michigan offensive lineman. Hey, whatever works. In all seriousness, it was two stout defenses and two lukewarm, rusty offenses. Theirs couldn't score a touchdown in the redzone if their lives depended on it, while we could barely get a drive started, with the run or with the pass. It was ugly, but I couldn't be prouder of our defense. I look forward to watching them grow as a unit. Now, as for the offense, specifically Denard, it is time for Borges to pull out his magic wand and use that Cade McNown magic from back in his UCLA days. We don't need a great passer, nor a good one, just a decent one that can make passes with one-on-one coverage. We need to hurt opposing squads for loading that box and preventing those sorely missed 70-yard Denard Robinson runs. If that happens, next year will be enjoyable with a lot of winning, otherwise, every defense loads the box and it's miracle &quot;up-for-grabs&quot; pass time all year long. Work on that pass game, Denard! Go Blue!!! Thu, Jan 5, 2012 : 7:40 p.m.
We scored 2 touchdowns. Our defense held them to one touchdown. We won the game. Makes sense to me. Thu, Jan 5, 2012 : 7 p.m. Fortunate win, but a good win. Fortune, luck or whatever you want to call it, it's a factor in all sports. Some posters here may say what they want to say about DR, but us athletes know a balla when we see one, and DR's a BALLA! A balla ( baller ) will make mistakes but most of the time will put the team in position to win ( 11-2 ), and that's what DR did. VT executed a great defensive game plan and shut our offense down, but non-the-less, what some call a hailmary or jump ball was actually a great play, DR alluded the blitz, escaped the sack and got the ball out ( although close ) to JH for 6, had he been sacked or thrown it out of bounds, UM punt and lose in regulation. The 2nd TD, great pass by any standard, back of the end zone where only JH could get it, and again with pressure. VT stopped the run but he beat them with pass when it counted. Thu, Jan 5, 2012 : 9:58 p.m.
Tally10, those were 2 very good passes by DRob and great catches by Junior. You make a good point about DRob avoiding the sack on the 1st one ... it sure looked like he was going to get caught on that play. Thu, Jan 5, 2012 : 8:27 p.m. Even the 1st TD to Junior was a pretty good THROW, over the CB and on target for JH. Of course DR missed seeing the safety coming across to help - big mistake but the safety didn't make the play, could have but didn't, and JH did. TD for the Blue. Agreed ... 2nd TD pass was fantastic ... great throw, great catch. Thu, Jan 5, 2012 : 6:13 p.m. I don't personally like the word &quot;luck&quot; in this case ... &quot;fortunate&quot; seems more appropriate in some ways. Football is often a game of &quot;breaks&quot; where one team enjoys the benefits of breaks. But as many other have pointed out, it's not so much randomness (&quot;luck&quot;) but rather skill and preparation that creates situations where the team is in a position to capitalize on good fortune. When I look at the defensive play by Michigan I see a unit that played out of their minds. They were 100 watt bulbs burning 150 all year. Yeah, frustrating 3rd-and-longs given up, but that's because they were defending against the run and counting on penetration by the D-line. They got some of that, but not enough to keep the QB from being able to pass. They did a fantastic job stopping their running back. My thoughts on Michigan's offensive showing have been made elsewhere. I'm inclined to start believing some of the analysis I've seen that suggests a lot of Borge's game plan was based on running behind Molk's blocking. With Molk's effectiveness diminished it forced more outside runs, which ran into the teeth of VT's defensive strength. At any rate, the ball is shaped funny which makes the game interesting. Speaking of &quot;breaks&quot; ... did y'all see West Virginia's strip at their goal line with the 99 yard runback for the score? Wow. WVU's QB had all day to throw. I predict Casteel will go to Arizona. I may be wrong. But I sense RR's holding off on hiring was based on getting past last night's game. Thu, Jan 5, 2012 : 11:01 p.m.
Thu, Jan 5, 2012 : 8:21 p.m.
Thu, Jan 5, 2012 : 7:22 p.m.
Thu, Jan 5, 2012 : 6:42 p.m.
DonAZ, I also expect Jeff Casteel to go to Arizona. I expect the UA AD, to pay whatever it takes to get him out there. If Rodriguez &amp; Castell DO re-unite, I think UA will do VERY nicely over the next ten years. I supported RR while here, but never felt he was the correct hire. Sadly, we have learned that many in the UM fan base, former coaches and players, included, behaved in manner that was 'not appropriate'. I hope RR does well out there, (He's a Michigan man), and who knows, maybe we'll see a few Hoke/Rodriguez matchups in the future. Thu, Jan 5, 2012 : 6 p.m.
Lots of good comments above. Not a pretty win, but a win indeed. The thing about Hoke is, I'm sure he's still not satisfied. He knows the O sputtered, but the TEAM made up for it in other ways. If I hear again that TD should have stood again, I'm gonna puke. I don't care what anyone says about the elbow hitting the ground first, was in bounds, etc. IMO, the ball made contact with the ground, and that makes it incomplete. GO BLUE!! Thu, Jan 5, 2012 : 5:30 p.m.
An ugly win is far preferable to a pretty loss. They won because they played hard, never gave up, made less errors, and stopped the VT offense when it mattered the most. It was not a lucky win in any way, shape, or form. They adapted to the situation at hand. That's what makes perrenial winners. Sat, Jan 7, 2012 : 3:12 a.m. It was embarrassing to act like we just won the Super Bowl after that game! The attitude should've been we're happy to gut it out and get the win but we're not happy at all with how we played and we're going to get to work on getting better and playing the way we want to. It was lucky in EVERY way, shape and form! You literally don't know the dictionary definition of luck! Accepting gifts is not adapting to the situation at hand! You diminish true accomplishments when you pretend that non achievements are achievements. We didn't outplay that team. We didn't play well enough to win in the abstract, and only did in this game in the literal sense that given the amount of mistakes the other team made, our low level of play was, LUCKILY, good enough! Our hard play didn't make low Beamer call a fake punt on 4th &amp; 1, turning it into 4th &amp; 15 from the kickers perspective! With that qb and his size and strength and passing and running and thinking ability, with that line against ours in this game, lining up with a roll out run pass option they had at least a 60 or 70% chance. The fake has, what, 10, 15, 20% chance at best? Our hard play didn't make the guy miss in OT. I could go on but use your imagination. Great victory! Let's be honest; Mich was fortunate to be in the bowl game and fortunate to win. Both seemed to be as a result of another team's loss rather than their own victory. I'm sure all would agree that it's better to earn it outright so no one can point fingers. Mich. has always earned what they received; their program is larger than life. Maybe next year that will happen. Fri, Jan 6, 2012 : 1:15 a.m. Yes, and it helps that the head of that Bowl Committee is a UofM grad. Thu, Jan 5, 2012 : 5:49 p.m.
With all due respect, Jim, I can't buy this analysis. This team has indeed earned its way to where they are. The SugarBowl invited us, not the other way around. Of course other teams lost and we advanced, that is how the system is set up. Invites, rankings, etc do not occur in a vacuum. We weren't out their lobbying for the accolades, no cry baby tweets, just hard play and wins. You can make the case for this years team having more character and grit for winning again and again, than a team who easily crushes every opponent. Grit and character, that's the Michigan Way, for God's sake. Thu, Jan 5, 2012 : 4:08 p.m. Sat, Jan 7, 2012 : 2:53 a.m.
jeez Lorain you're twisting truth, logic and your own dignity and integrity into knots! My god will it really hurt your heart that much to make the simple and obvious statement that we got totally and completely outplayed all night and were only remotely in the game ENTIRELY because of an incredible series of coaching and playing FAILURES from the oppenent?! We didn't remotely play well enough to win, just admit it! If you asked any player or coach before the game if we would win or if we would deserve to win if we played the way we did not one of them would say yes! I could break down a whole bunch of plays and decisions to show how lucky we were in a forensic way, but the overarching point is that when you go to the Sugar Bowl and play as poorly as we did, then regardless of how the individual plays breakdown in terms of lucky or not, you are simply and obviously lucky AS HELL that ANOTHER team making it to the Sugar Bowl could POSSIBLY make so many mistakes and incredibly dumb plays as it took for them to GIVE AWAY this game!!! There is no SKILL in the other team self destructing! The fact that we can be commended for taking advantage of the gifts, and not quitting or choking doesn't change the fact that it took an amount of luck that has rarely been seen, especially by Michigan! Great, we got a lucky win in a bowl game for a change, cosmically if any team deserves to get a lucky win in a bowl game, after our history surely it's Michigan. But that doesn't mean that we actually deserved to win this game! Saying statistics are for losers rather than admitting you played a bad game and got badly outplayed when it's true, is for losers. Great wins, when we get them, will mean a lot more when we're honest about when we're great and when we're not. Saying we won the defensive phase demeans you and takes you out of the realm of seriousness. Are you a football fan or a blind patriot? Thu, Jan 5, 2012 : 3:12 p.m. Playing perfect with all of the calls go your way wins a lot of football games - but it doesn't tell a lot about your team. A bad day in one phase of the game, some of the calls going your way some going the other, taking advantage of the OTHER team's mistakes and sticking with it and making enough plays to win defines the character of this team. This Michigan team has character - from the head coach down through the whole organization. Great senior leadership, poise in not letting mistakes taking their &quot;eyes off the prize&quot;, and on and on... Character and mental toughness put this team in a position to win and they made the plays at the end to do it - Va Tech didn't. Injuries hurt during this game. On D, losing a starting lineman and a contributing back-up from a thin position hurt. The team figured out a way to largely contain Va Tech - one TD on 5, or so, trips to the red zone is doing a good job against anybody let alone the #11 team in the country. On O, the injury to Molk cost M the first series - perhaps setting the tone for awhile. He came back and played hurt. I wasn't on the sidelines so I don't know how much his injury effected blocking schemes and play calling, but he was not 100% and it undoubtedly contributed to our O difficulties (Va Tech's D also had A LOT to do with that too). Officiating helped and hurt. First I don't believe that was a TD catch in OT - and I didn't when I saw the play (Enough on that as it has already been beat to death). There were a number of no-calls that could have helped, and some that would have hurt, M if they had been made. A number of holding, face mask, pass interference calls could have (should have?) been made against Va Tech. Some could have been made against M too, most notably Gibbon's stutter steps (however I have not seen a replay that clearly shows the snap and the start of his stutter step, so I can't conclude that this was really illegal motion or not). All in all, an interesting gritty win. Thu, Jan 5, 2012 : 2:55 p.m. The only play that I agree that we were lucky was the fake FG pass play to Jareth Glanda. * Junior's 2 great TD catches were not lucky ... he mad a great play in both cases. Sure 1 was almost intercepted, but Junior made the play and the Va. Tech defender did not. You do not win a game by &quot;almost&quot; making a great play. * Our 3 FG's were not luck ... Gibbons made 3 good plays in a pressure situation. * Forcing 2 Va. Tech turnovers was not luck ... we made the play to force the fumble on the kickoff return, and Clark made a great play on the INT (Va. Tech QB was fortunate to be able to tackle him ... could have been a pick 6.) * The 2 &quot;almost INT's&quot; by Va. Tech were not luck ... one was interference and on the other the guy didn't make the catch. * Stopping Va. Tech twice inside the 5 yard line and giving up only 3 plays is not luck ... our D made the plays, like they have been all year long. * Va Tech scoring only 1 TD in 5 or 6 trips to the red zone is not luck ... once again our D made the plays to stop them. * The stop on the late fake FG by Va. Tech was not luck ... Jake Ryan made a great play. * The &quot;almost TD&quot; play by Coale was not luck ... it was almost a great play, but he did not make the play. Frankly, to say that we were lucky is a slap in the face to all the coaches and players who worked so hard to turn our program around. It wasn't our best win, and at times it wasn't nice to look at, but it's still a W.
Fri, Jan 6, 2012 : 4:26 p.m.
Justin, how about this ... because our D made a good play they forced Wilson to make a bad decision. So it was a good play by our D, and then definitely a bad decision by Wilson. Fri, Jan 6, 2012 : 2:01 p.m.
Thu, Jan 5, 2012 : 4:07 p.m.
rightmind, I agree that DR's long passes are frequently (usually?) in the &quot;toss 'em up and hope like h_l_ something good happens&quot; catagory. Ironically, both of these passes were pretty well thrown. The one to the back of the endzone was thrown where Junior was the only one with a chance to catch it. The one to the sideline was on target to Junior - DR did TOTALLY miss seeing the safety help coming across, or he wouldn't have made that throw, and was really lucky the safety couldn't make a play. However, your point is well taken that on long passes DR seems to put it up and pray more often than not. Some of your points make sense however you can't say that Michigan caused all of these plays to happen. Their D was not all that impressive in the red zone, it was Va Tech's offense that was pathetic. Michigan didn't cause David Taylor to run 27 yards backwards and force it nearly impossible to get into the endzone. I'm not saying he would've scored by any means but he doesn't run backwards you have two more plays from the 8 or 10 yard line. Also watch the video of the Va tech player returning the kick. Michigan didn't cause him to fumble at all, anyone could have went up to the guy and literally snatched the ball from him. The one play you said was luck was the fake FG pass that was somehow magically tipped to a Michigan lineman is a HUGE difference maker in this game. He doesn't catch that pass and Michigan doesn't get the field goal on that drive, which means VA tech wins in regulation. I'm sorry I don't mean to make you Michigan fans mad because VA tech did make so many terrible mistakes, saying that Michigan didn't have any luck on their side is completely false. Without luck they wouldn't have won that game plain and simple. I consider them most lucky that it wasn't an SEC team playing in that game because everyone knows that an SEC team wouldn't only score 1 TD in 6 red zone attempts. Playing an ACC team in the Sugar Bowl is about as lucky as any team can get and that's not even the funny part.... Va Tech finished 2nd in the ACC. It's sad that these two teams were playing for a sugar bowl because quite frankly Michigan showed why they didn't deserve to be in a BCS bowl and Va Tech AND Clemson showed why ACC teams should NEVER be considered for a BCS bowl. They both showed how much of a disgrace they were these last two days. Thu, Jan 5, 2012 : 3:43 p.m.
Hemmingway's catches were not luck. He has shown the ability to bail out Denard all year. Any time Denard throws the ball downfield he is relying on luck. He has no target. He is just throwing it up there. Who will bail him out next year, Stonum? Not hardly, he won't be back, unless all the bs about morals, family and hoke is untrue. Thu, Jan 5, 2012 : 3:17 p.m. Totally agree, missionbrazil. Va Tech made mistakes that the Blue took advantage of. Va Tech didn't take advantage of Michigan's offensive struggles (their D was pretty quick and impressive). In the final tally, Michigan made enough plays to win and Va Tech didn't. Thu, Jan 5, 2012 : 2:58 p.m.
that should be late fake punt by Va. Tech, not fake FG. Thu, Jan 5, 2012 : 2:25 p.m.
there is a lot to be said about staying together and believing, NEVER giving in. This team has proved it over and over this year that they are never out of any game, they have a coach who coaches in a positive not negative manner (Brian Kelley, Rich Rod) Brandon Gibbons is a perfect example of being coached UP by Hoke and company and not ripped to shreds and losing confidence like was done last year. Congrats to the seniors for LEADING Michigan to a great season!!! SUGAR BOWL CHAMPS! Also, I was just wondering how come Murrow's Ghost and 1st Down have not chimed in, I hope you guys are alright and I miss reading what you guys have to say. Some may say that Michigan did not deserve to win. I say, tell that to the Michigan football team and ask them to send the Sugar Bowl trophy back to New Orleans. You can look at this way, Va tech lost the game more than Michigan won the game. It was one of strangest games ever played by a Michigan football team. The lack of offense, the referee calls that went our way and having some key players hurt or hundered still added up to a narrow victory. Mission accomplished, a sweet victory, well earned and well deserved...GO BLUE and Happy New Year! Thu, Jan 5, 2012 : 2:05 p.m.
Like I've stated in earlier threads, I don't know how many times U-M played a fantastic and pretty game and yet somehow still lost. So I'll take an ugly win any old day. A team that works hard and continues to fight for every inch will more times than not put themselves in a position to win and that is exactly what happened here. What seems to go unmentioned to me is there was a lot of holding by VT not called and Pass Interference as well by VT Defenders who seemed like they were early on contact on many passes but got away with it. We might've been fortunate in the calls that went our way, but they were the right calls. VT made miscues and we took advantage of that, we earned the victory, it wasn't given to us, we made our FG's. Plus Molk being hurt sure seemed like it hindered our Offense, kudos to him for sucking it up and playing through the pain, see you on Sunday's Dave. Thu, Jan 5, 2012 : 1:57 p.m.
Luck or no ... the offense was strikingly anemic compared to the prior three games. From MGoBlog, <a href="http://mgoblog.com/content/reforged-fire" rel='nofollow'>http://mgoblog.com/content/reforged-fire</a> &quot;It's apparent Borges wants to put guys in the box instead of spreading them out, forcing the opponent to respect the horizontal aspects of the defense, and then making you tackle and fill one on one; maybe that will work against a VT when Shane Morris is throwing to LaQuon Treadwell. It did not here.&quot; I have not yet seen nor heard of any explanation from Borges as to what the game plan was, why it didn't work, and what attempts were made, if any, to overcome the VT defense. Has anyone else? Will there be any post-game press conferences to review and discuss the game? Thu, Jan 5, 2012 : 7:49 p.m.
@tulsatom -- I read over on MGoBlog (some GREAT stuff over there, by the way) about the game plan and Molk. Theory is Borges knew about VT's athleticism on D and was counting on Molk to lead the power game up the middle. Molk plays hurt, which means the game plan's premise is diminished. Outside runs go into the strength of VT's athletic LB and secondary corp. And as I read over at MGoBlog, our receivers saw very little separation from VT defenders all night. The lack of short screens mystifies me. There was one early and I think one other. Neither worked. I wonder if Borges simply didn't trust Robinson to execute those with VT's shifty/fast defense? I just don't know. @truebluefan -- see, I like Borges ... PROVIDED he retains lessons learned. I thought he had a kind of epiphany regarding speedy dual-threats and the merits of some elements of the spread during the Illinois/Nebraska/OSU series. Then for some reason all that went away and we saw what looked like early-season Denard again. WVU's drubbing of Clemson does indeed throw a wrench into the transitive property thinking about &quot;we played X, and X played Y.&quot; WVU looked pretty good last night. Their QB Geno Smith had ALL NIGHT to throw most times ... Clemson defensive pressure wasn't that great. Still, between him and Tavon Austin they played a great game. Plus, that takeaway at the goal line and return 99 yards absolutely demoralized Clemson. Thu, Jan 5, 2012 : 6:45 p.m.
Don -- great points about the offense. I, for one, am not a fan of Borges. The game plan was ridiculous. Where were the short, high percentage passes? Why was Denard bombing it downfield into double coverage every time? We are a running team and the rush was going nowhere. We needed to counter with short passes, flares and bubble screens to open up some running lanes. We didn't and by all rights we should've lost that game if not for a few very fortunate occurrences. BTW, last night's complete and utter WVU drubbing of Clemson (ACC champion by a wide margin over VaTech) doesn't make us look any better. As was the case countless times this season, the defense bailed out the offense. It has become quite annoying, well, to me anyway. Thu, Jan 5, 2012 : 6:41 p.m.
Don, My thinking is that it was a combination of all the things you mentioned (good analysis, by the way), and the fact that they are trying to establish a power game with linemen (except for Molk) who were recruited for the spread offense and who are not in the same caliber and talent level as the Jake Longs and Steve Hutchinsons of the world who used to knock people around. Va Tech's defense reminded me of MSU's -- quick yet physical, which has given U-M problems all year. With recruits like kallis coming in, I think the future is bright for the OL. My sense is there's a combination of things that went on: a) VT's defense just played a great game (give credit where credit is due) b) The layoff affected Robinson's timing/decision-making more than expected c) Borges truly thought the run game could be established despite VT's defense against it I am not down on Borges ... I agree we are fortunate to have him as our OC. And as I've said many times elsewhere, I'm very glad Michigan won that game. It's just there were echoes of prior year offensive failures (not just past three years ... echoes going back many years) that disturbed me. And I agree, when Denard is not &quot;on&quot; it can be a problem. He seems to forget coaching lessons and revert to his earlier playground ball days. That's why I say I think the layoff affected him more than we were led to believe going into the game. Thu, Jan 5, 2012 : 2:17 p.m.
Don, I really feel like Denard, when he's not on, really hinders the play calling. That's the best answer I can come up with, Borges didn't just become dumb over night, he's got a pretty impressive track record. Even though I was frustrated by the Offense, I still feel like we're lucky to have Big Al as OC and we'll be fine moving forward, we just need a real QB, sorry Denard I love ya and you're exciting and all, but you drive me nuts sometimes with the way you throw the ball and when you throw it. I hope that helps Don. Thu, Jan 5, 2012 : 11:54 a.m. Call it lucky, call it ugly, call it what ever you want. Its a win, and UM went 11-2. Thats fantastic considering the past few years. They have exceeded just about everyone's expectations, and are giving every fan a future to be excited about. Good football teams can find a way to win even on a bad day, and Michigan proved that it can. Michigan didnt make the mistakes VaTech did, and came away on top. Congrats to the team, staff, and to the seniors who endured a wild career at UM. Go Blue! Thu, Jan 5, 2012 : 11:48 a.m. It was kind of ironic that U-M won the game on special teams and turnovers in light of special teams and turnovers being Virginia Tech's claim to fame over the years. To the objective observer. U-M didn't deserve to win that game because the Hokies dominated the line of scrimmage, total yards, and time of possession. However, U-M kept believing and fighting and found a way to get the job done. The key penalties and turnovers went U-M's way and sometimes it pays to have luck on your side. Sat, Jan 7, 2012 : 2:03 a.m.
&quot;I laso found that teams that work hard and don't stop fighting tend to be &quot;luckier&quot; than those who don't.&quot; There's a difference between that maxim having some truth and a situation like this in which either you believe in the concept of luck or you don't. for if there's ever been an accomplishment that fits every known definition of lucky more definitively than this then prey do tell! Can you seriously come up with another football game you've ever seen in which a team got THAT lucky THAT many times in order to squeak out a less deserving win? Thu, Jan 5, 2012 : 12:13 p.m. I laso found that teams that work hard and don't stop fighting tend to be &quot;luckier&quot; than those who don't. Thu, Jan 5, 2012 : 11:56 a.m.
Or the fact that in the previous few years, special teams and defense were completely neglected. Now thanks to them, UM came home as the Sugar bowl Champs.